5 miles in Central Park on Monday. My legs were dead, but I was desperate to run outside. I tackled Cat Hill, but rather than the West Side Rollers I did a loop around the reservoir so mileage still came in where I wanted it to. This was my first real test of the plan to use Cherry Blossom as a training run for Brooklyn, would my legs rebound after the race or would I have to rest like after the Halfs? Verdict, iffy, but better. #RunTheDate is becoming a thing in this weird training cycle. Friday 3.30 on the treadmill before heading home for Easter. Rather than the days where 5.5 feels impossible, it’s starting to feel easy so I did some flying sprints at the end. Maybe time to try 5.6 or 5.7 as a base. inSANE given a look at last April’s logs where I was in the 13s. Makes it easier to feel better about my lack of speed progress, but I know I need to get back to Mile High know that the knee is in better shape. Saturday, I really wanted to go back to Rockland Lake, but two people and one car meant that wasn’t possible so I hit the South Nyack trail. I like that trail. I’ve had some good runs on it. But it’s only one mile long and there was a whole lot of do not wanna going on when I realized I’d have to run eight x the .7 mile spur to get to 10K. Nope. Luckily on the 2nd out and back I realized that the Grandview spur/Hader Park/Old Erie Path had opened. Whee. While breathtakingly gorgeous along the Hudson, it’s not a finished trail the way the South Nyack part is. It was definitely my first true trail and although I only realized it only halfway through, my legs were pretty tired from Friday. It was the first back to back of real distance, and a test. I almost bailed at 5 miles, but pushed through to get 10K. It didn’t feel great, but was good to get it done. I needed an advil when home, but was otherwise OK and new to me scenery was wonderful. Sunday. True rest day. No run, no walk other than home from train. It was needed. I’d run 23.5 miles the week of 3.18 (almost positive my highest volume due to off days after both Halfs) and the drop to 16.6 was needed as a non taper taper. I thought I’d run outside today like last Monday. And then I woke up. Nope! On the plus side, the shoes I ordered during New Balance’s VIP Night came in and I got to take them out for a 4 mile (yep, #RunTheDate again) spin on the treadmill. Miles 1-2 were deadly, mile 3 felt like 3 seconds and 4 was good. I good have gone further but decided not to push it since the plan is to run tomorrow. Finished with a flying spring at 6.0 and 6.2. Knees feeling good. I’m ready for Sunday. I’m also loving my new headphones. After killing yet another pair and another bout of swimmers’ (err, runners) ear, I went with some open ears. I can see why everyone raves about Aftershokz. They’re pricy, but oh so good. Mine are red. Meant to note earlier and I forgot, I filed for my gym reimbursement in February which marked the first time I’ve completed both halves of a year at 50 gym visits apiece. Would have been December, but I lost July/August to the gym closing. Still, wow. 499,338 steps (so close, so mad. But it was one hell of a sprint to try to hit it. If I could have gotten into my spreadsheet at home, I’d have found 700 steps. I thought I was further away. Still March remains an insane month. 219.08 miles run/walked. This is probably a personal high. I’m really happy with that. I’m not exactly on pace for 2,500 miles run/walked on the year, but spring and summer will be better, so I’m OK with this. I’ve stopped obsessing about pace and time spent running. The runs themselves are naturally longer due to running longer distance and I haven’t really done any speedwork to speak of. That will be after the Brooklyn Half and probably when I try for a sub 30 5K. April 29 – March of Dimes’ Walk. I do this every year. Great cause. Last year I ran it, but it’s kind of annoying with the cross streets not closed, so I might just walk it. May 18: Brooklyn Half. I have no idea on timing as I’ve never run any of this course. I feel like I’ll be well trained, despite business travel two weeks prior. This is likely to remain my sole race for the month due to a conference that follows too. I had to go look at the NYRR calendar here as it’s nuts. Basically, yes. All of those. June 3 – Italy Run. Inaugural NYRR race and can’t pass on this one with my heritage. Some is going to depend on how I recover after Brooklyn, but I’m going to say under 57m and beat October. June 9 – Mini10K. Have fun! I want to say 1h10, but it has the hills and I have done zero hill training to speak of, so maybe 1h15? Either way, it will be a PR over last year. 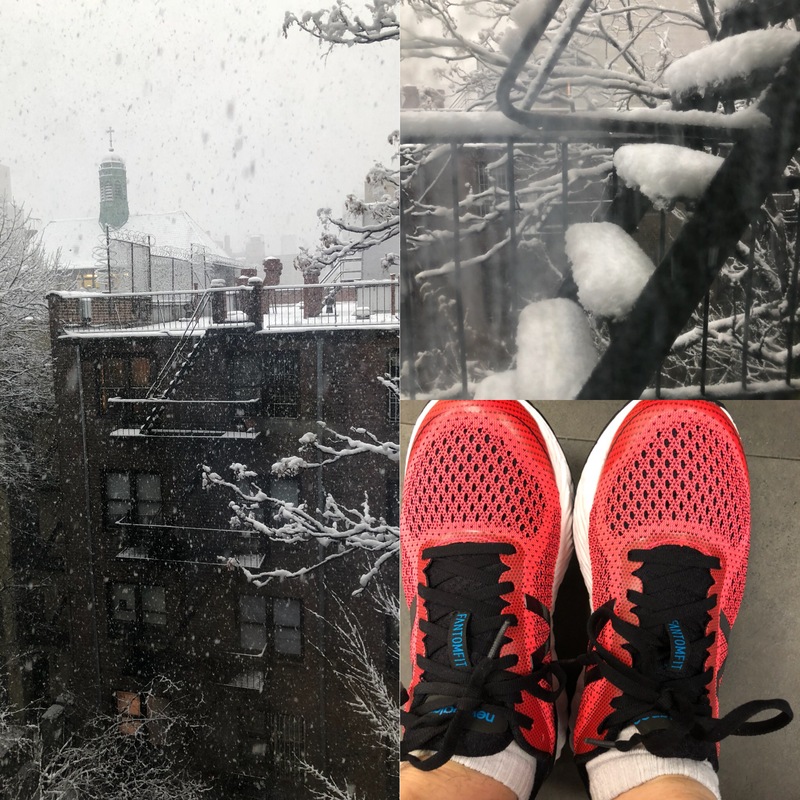 June 16 – Queens 10K. No idea, not at all familiar with the course. Going with 1h10 as above. This is purely because it was a free New Balance Reward and it will get me 4/6 if I want to run the NYC Half next year. 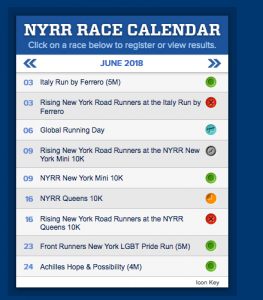 June 23 – Front Runners New York Pride Run. Another 5M. As of now I’m going with the same goal as for the Italy Run and I’ll reevaluate once I see how that goes. June 24 – Achilles. Will be a test of back to back runs. Luckily this is only 4M. For the moment going with 43 per Gridiron, but my legs may well hate me by then. July 14 – Retro 4M – have fun, be silly. July 21 – 12M run. I’m not running this November, but I feel like I might need some oomph for a long run and might decide to do this. Will likely depend on weather. July 28 – Team Championships. Anyone else running these and want to meet up? Looking forward to my first RTY meetup at the Cherry Blossom Expo Friday. Hope you’re feeling better by Sunday. Canal marathon sounds wonderfully scenic. I dropped my run goal to 700. I think it’s doable. Congrats on some great mileage in March! Im sure it will be easier to get your runs in once the weather improves. It looks like you are doing great with your 2018 goals too! I never thought about adding up my steps for the month. I track and log them weekly and probably average around 425,000 steps per month. You were so close to 500,000! I may be picking your brain at some point about good races to run in NYC. My son and daughter-in-law just moved to NJ and we’d love to do a race while visiting sometime. I’ve been doing a steps challenge since 2010 since I got a Jawbone and then Fitbit. I love it and it’s hugely motivating to get up and move. It’s called #GoTheDist. It’s amazing to see how much extra running adds, even though it makes total sense. Monthly makes me less crazy than daily, which fluctuates.